It’s an 876′ drop and he’s sure a jump from this height will do the job. It’s that feeling. When your toes are at the edge of a great height, something that the mind registers as sheer danger, certain death. When he was young, roller coasters and carnival rides invoked such heart-dropping overwhelmingness. As he aged, everything from a swing set to an elevator would bring it on. The jump. Plunging toward the bottom of the gorge, a spectacular blur of autumn’s myriad hue in every corner of his eyes, the river widening as the distance between he and terminus shortens, he prepares. A gust upward, like a strong wind against a sail, and his parachute opens. Spectators cheer him on. He sees the mountainside, his fellow BASE jumpers. The feather that he is floats defiant of gravity and into Mother Nature’s chasm. A small town in the gut of where elevation rises and falls rejoices as he and his fellows land safely somewhere far below in the New River. A 1997 Toyota 4Runner careens down a thin slice of pavement the state of West Virginia has deemed appropriate to call Highway 82. He barely misses an oncoming pickup truck, the couple inside veering as far right as possible without hitting into sheer mountainside or a good thick sycamore. The occupants of the pickup gasp. She crosses her heart, not hoping to die but very much thankful the otherwise. He, behind the F-150’s steering wheel, immediately comes to the conclusion that all locals learn to drive like this, on these kinds of roads. The incident passes in a moment or less, no one scathed. Thin trees grow their trunks grey against a dark forest, still vibrant at the end of October’s golden leaves highlighting the every dotted in-between like stars against a space on earth. The headlights of the F-150 come on, automatically, as the sun goes down, and one of those yellowing trees preparing for coming Winter month’s watches as the pickup itself seems to zoom away. 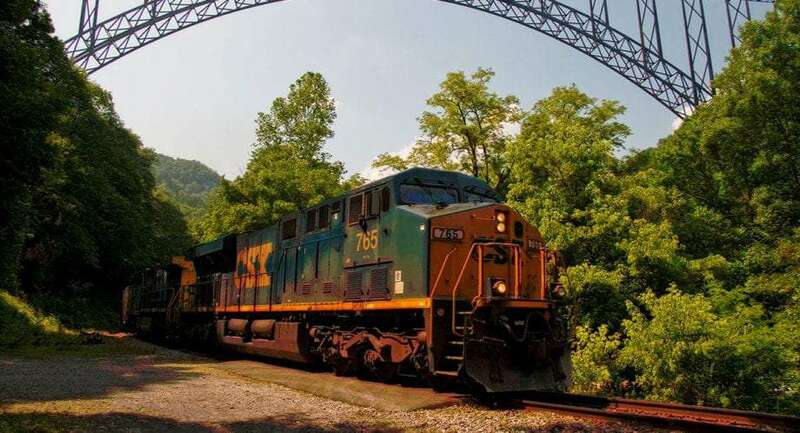 The 800 feet below, a train makes every local resident, every trailer, every old farm house and cabin, every lingering RV and tent camper well aware of its slow plodding jaunt through the belly of the gorge. Two lane roads follow close beside the tracks, still very much in use. Some have been replaced, and some of the old rails still rest dormant alongside the newish upgrades that modern day cars bear the load of a nation’s freight upon. Headlights from what would normally be seldom seen traffic pile up in wait as the train crosses slowly a bridge, a roundabout the mountain. Some newcomers to the area, transients, find the sound annoying and toss occasionally through the night as the rails get run. Locals and those with a particular love of a good, distant train whistle find it more of a lullaby and wake up refreshed, early shining and rising after another day’s pursuit. Silhouetted against a brilliantly blue sky for October, star-shaped sweetgum leaves mock the parachute wielding bridge jumpers descent, as their don’t as much fall as they do gently nestle into the ground. What man invents, nature so often inherits as instinct. Summer cabins, now largely empty as family’s attend to children in far away city’s schooling and older men who can no longer justify Monday’s off at work, begin to show signs of hibernation. A campground near Gauley Bridge runs amuck with teenage werewolves and school teacher fortune tellers in a makeshift but convincing haunted house. Another Sweetgum leaf releases itself from the limb. Autumn is waning heavily. Some elevations are pure swaths of seemingly dead trees, only a stripe or speckle of pine and cedar dotting the mountainside like ragged hunter’s camouflage piled against a stack of old barn wood. A few lingering lines are cast. Rafts piled atop one another in steel sheds welcome the respite from cold water running rapids until spring proves its thaw. Waterfalls still fall, around nearly every bend. Raptors–vultures and hawks mostly–circle. 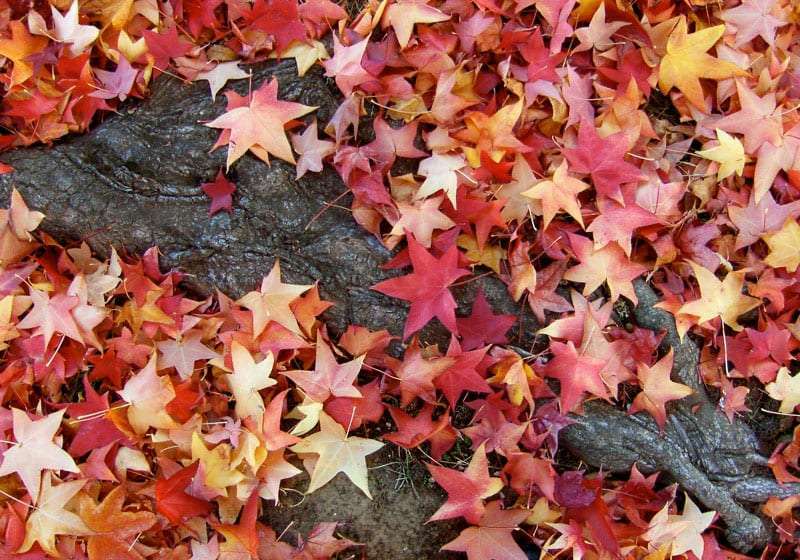 Sweetgum leaves fallen to the ground. Photo by Alice. 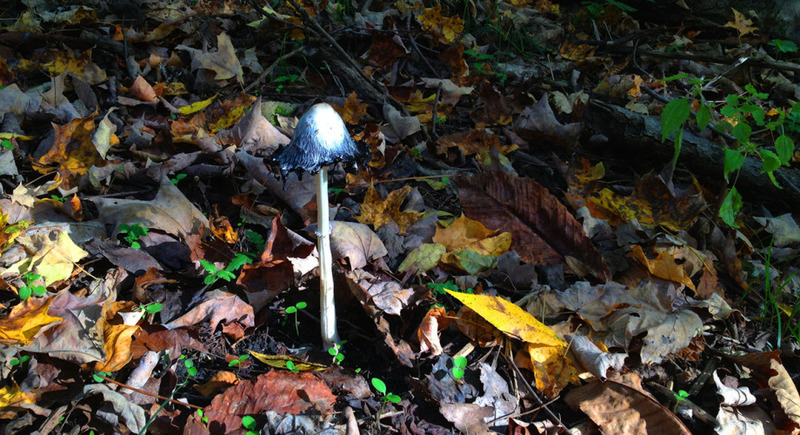 A mushroom in the forest near New River Gorge. 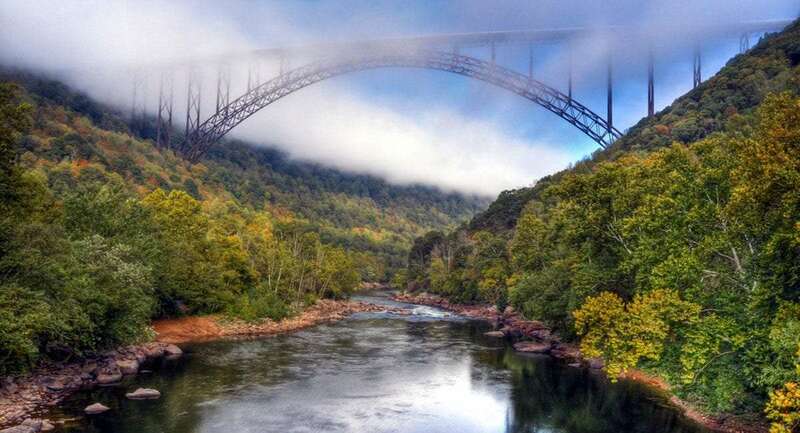 The New River Gorge loses its touristy traction as the adventure-seekers, the fishermen, the RVing summer crowd goes their own way. Left instead is the subtle sound of rushing whitewater and a train’s wheel against the steel rail of what is now the area’s modern history. Come January, six days of school may be all the local children are forced to endure. If last year is any indication, anyway. Tonight though, through the all but extinct traffic on US Route 60 as it parallels the New River, only a dim light shines from a forgotten switch in an Airstream’s bathroom window. The family inside will wake up tomorrow to see the final sweetgum leaf of that particular tree has fallen to the ground, and pack it up and head south, chasing autumn. As every last leaf tends to do. We’ve got an article all about nearby Fayetteville and one touching on Thomas in the northern part of the state. 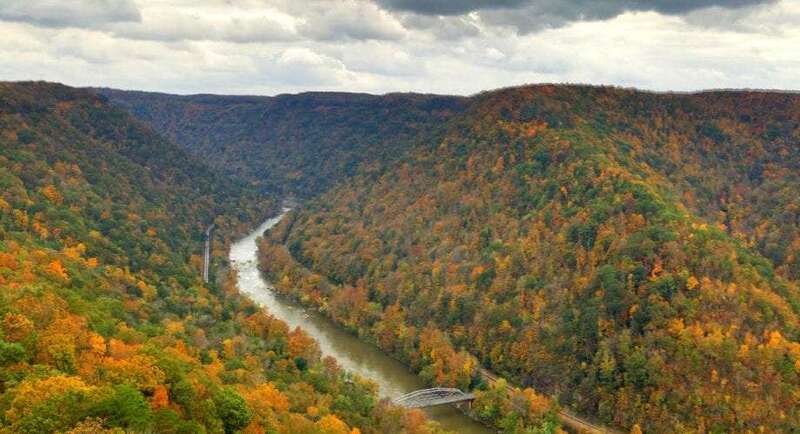 Be sure to check out Visit Southern West Virginia’s website for plenty of other tips on what to do and how to find it! 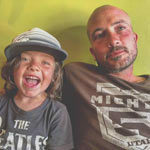 Lyons, Colorado is somewhat of a dream for young parents with kids, as the town affords venues where mom or dad can have a drink or two while watching a band and the kiddos can play good fun games.